At least once a week I'll cook something Asian inspired, from lo mein, stir fries and tofu to grilled meats using ingredients like soy sauce, hoisin, Sriracha, ginger, and sesame oil in the marinades and sauces. 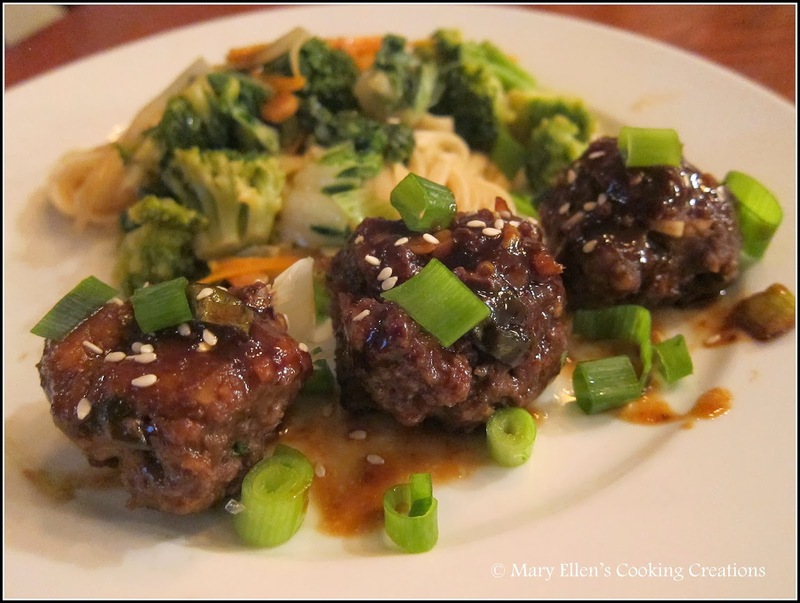 I'm always looking for new ideas so immediately pinned a recipe I found for Saucy Asian Meatballs. I served the meatballs as a main dish alongside some vegetable lo mein, but they would be awesome appetizers too. The meat is packed with flavor - ginger, garlic, and green onions - and the sauce is sweet and sticky and immediately reminded me of a steak sauce I made several years ago, a sweet and spicy hoisin sauce. The sauce is so good that next time I will definitely make more to serve over rice or noodles. The original recipe does not cook the sauce, however I did heat the sauce and let the meatballs simmer in it for a bit before dinner. In a large bowl, mix together meatball ingredients until well-combined. 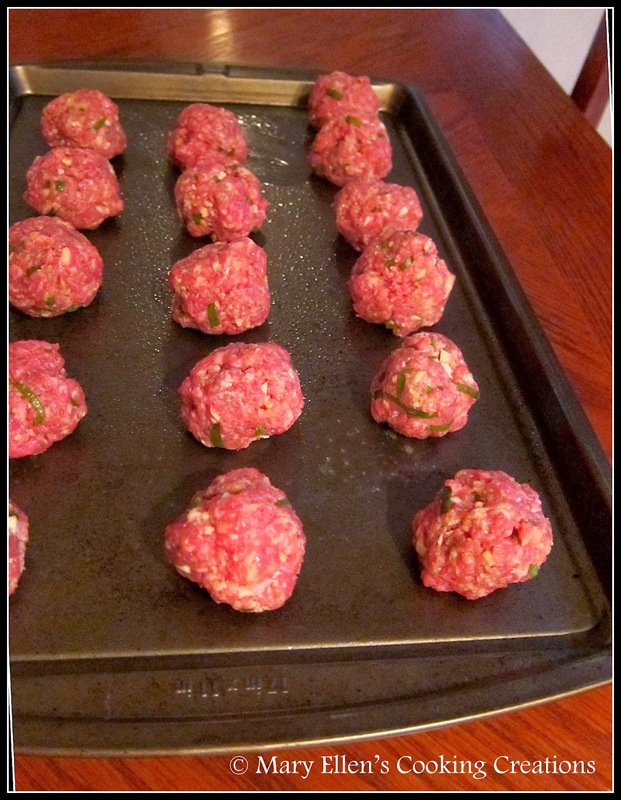 Shape into balls and place on a greased baking sheet. Bake for 10-12 minutes, or until meatballs are golden on the outside and no longer pink on the inside. While the meatballs are baking, heat olive oil in a large sauté pan. Mix the hoisin, rice vinegar, soy sauce, beef broth and sesame oil in a bowl and set aside. Add the garlic to the pan, sauté one minute. Add the ginger and sauté quickly. Add the sauce mixture and bring to a slow simmer; the sauce will begin to thicken. If you need to thin it out, add some beef broth mixed with soy sauce. 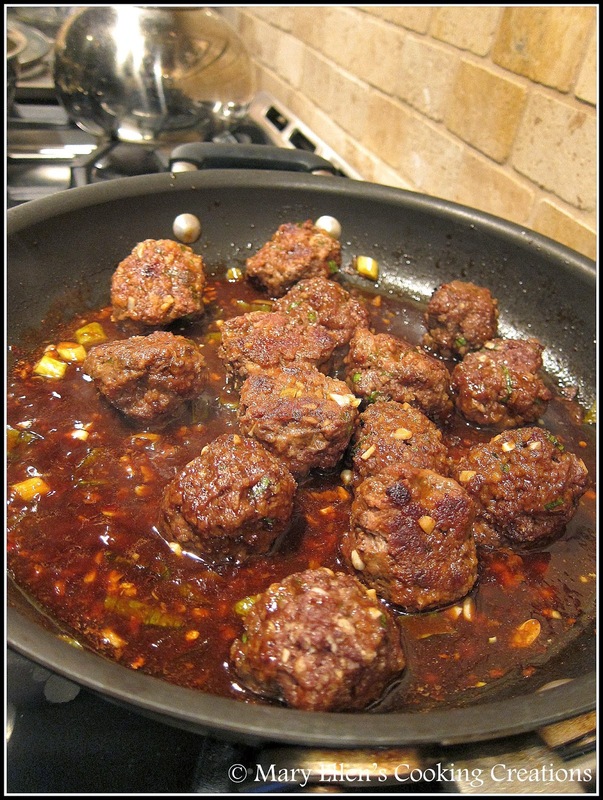 When the meatballs are done add them to the sauce and let simmer for a few minutes. Top with sesame seeds and green onions for serving. These look sooo good. Must try!